Okay, so you're probably wondering, "Illinois? What happened to the Hamiltons?" Well, Illinois Watch Company had a long history as a respected watch company before it was acquired by Hamilton in 1928. And for the next few decades Hamilton maintained the Illinois brand name and sometimes combined the two - Hamilton Illinois. To be honest, I don't know anywhere near as much about Illinois watches as I do about Hamiltons. But I do know Illinois was highly regarded for it's pocket watches. They also were well known for their small watch movements but they mostly supplied loose movements to jewelers, rather than having their own formally cased models. 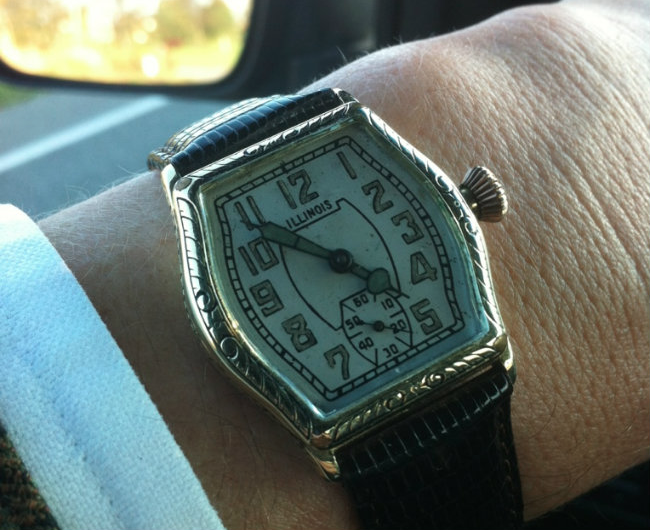 That started to change when Illinois introduced a variety of it's own wrist watch designs in the early 1920's. Watches featured 6/0 sized movements as well as 3/0 sized pocket watch movements. Sub second registers located at the 6 or 9 position were typical options. 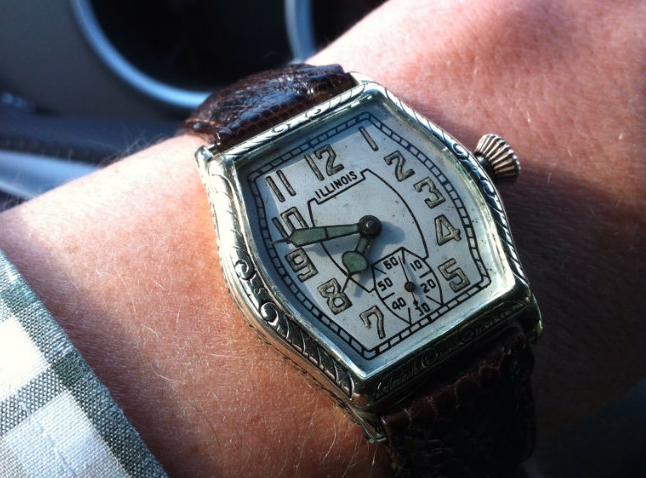 The only Illinois wristwatch that I have acquired (so far) is a 1928 Illinois Mate... also known as the Special Model H. So far I have resisted the temptation to purchase more, as it would be a whole new area of spare parts, etc. to learn about. However, these 1920 and 30's watches are very tempting. The Mate came with a variety of options... plain or engraved bezel, white, yellow or green gold filled cases and a variety of two-toned dials. The purchase price range varied from $37.50 to $52.20. The watch features an interesting barrel shaped case and uses the 3/0 size 17 jewel 307 movement. It looks very similar to a slightly smaller 6/0 sized model called the Ensign (aka Special Model B). I really like the size of the Mate... the 3/0 movement is considerably larger than a 6/0 watch and it presents well on the wrist. Here's a couple of wrist shots of my green gold filled version. This watch was a bit of a wreck when I got it and I'm really pleased with how it turned out. How much are the Special Model H's worth? Depends on condition but a nice recently serviced example is easily $350 if it looks as nice as the example above. I have a 1928 special H. I'm not comfortable winding it. Can you advise me. Also can you tell me why the stem is spring loaded. Push the stem in and it springs out. What's the purpose of that? The movement is "negative set", meaning there are springs inside the movement that keep the watch in the setting position. There's a sleeve in the case tube that holds the crown in the winding position when the crown is pushed in. If the sleeve is worn, it will allow the crown to pop out to the setting position. It sounds like your sleeve may be worn and would need to be replaced.